Huawei P20 Pro is the latest flagship smartphone from the Huawei. The phone comes with some of the best features and specs and one of the most expensive Huawei smartphone yet. The new Huawei P20 Pro runs on the HiSilicon Kirin 970 system-on-chip, 6GB of RAM, 6-inch Full HD+ (2244×1080) OLED, 24MP front-facing camera and packed with 128 GB of storage. The phone runs on the EMUI 8.1 on top of Android 8.1 Oreo. And now the best news is that you can root this phone with the help of Magisk manager. But for that, you need to unlock bootloader of Huawei P20 Pro and after that, you can Root Huawei P20 Pro. TWRP recovery is currently not available for the Huawei P20 Pro. so all you have to patch the boot image on your phone to run the magisk boot manager. Here is the full and complete tutorial which you can follow on the Huawei P20 Pro and get the root access on the phone. All credit goes to the XDA member LastStandingDroid, who released a patched ramdisk image for the Huawei P20 Pro. 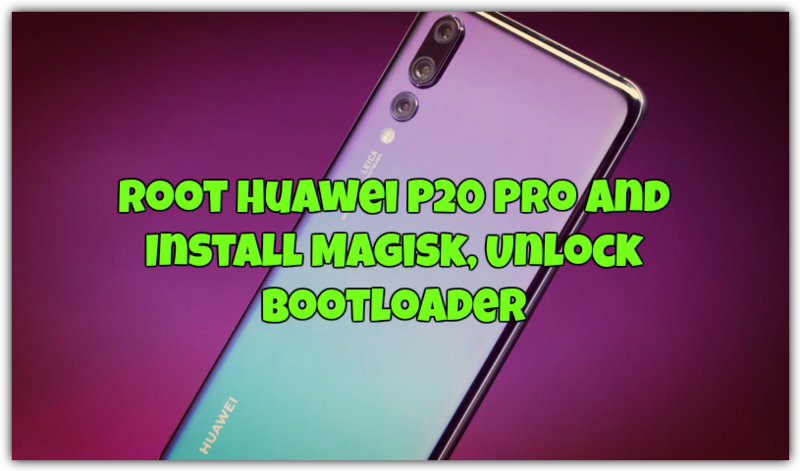 Which allows the Huawei P20 Pro user (with device name: CLT-L29) to root their device and install Magisk. But before following the guide how to Root Huawei P20 Pro and Install Magisk make sure to take the full backup of the phone. Coz unlocking bootloader will void the warranty of your phone. And read all the steps very carefully and follow all the steps one bu pone on your phone. Warning: Technobuzz.net is not responsible for any damage that might happen to your phone during this process. You’ll lose all your data upon unlocking the bootloader. And make sure that your phone has enough battery to complete this whole process. Unlocking bootloader of Huawei P20 Pro is not a difficult task all you have to visit the Huawei site and apply for the Unlocking the permission and you can easily unlock your phone. Here is the full guide to Unlock Bootloader of Huawei P20 Pro. Once the bootloader of the phone is unlocked you can easily root the phone. Follow the below mention guide to Root the Huawei P20 Pro on Windows PC. 1. Once the bootloader of the Phone is unlocked. Download the Magisk Ramdisk img from the above mention links. 2. Now save the img file in the ADB folder that created while installing the ADB fastboot drivers. 3. Open the command window in ADB folder by pressing and hold the ‘shift’ key and right-click anywhere in that folder. 4. Now boot your phone in the fastboot mode. To do this, Connect your phone to the PC with USB cable and run the following commands to boot your phone into bootloader mode. 5. Once your phone in the Fastboot mode. Run the following command to flash ramdisk. That’s it. You Successfully rooted the Huawei P20 Pro. Hope you guys like this guide. If you are facing some problem with this guide then leave the comments below and we will help you to fix it up. I have installed twrp on my p20 pro and am having trouble installing magisk from a zip file as it is encrypted in twtp so can not find it. Will insralling magisk using this img file approach work with twrp installed or will it cause issues.